1. Preheat the oven to 200ºC, gas mark 6. Line two baking trays with greaseproof paper or baking parchment and spray with oil. 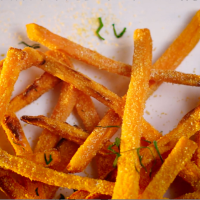 Peel the sweet potatoes then cut into ½cm thick fries, making sure they’re all the same size. Tip the fries into a colander then rinse under cold running water for a couple of minutes. 2. Bring a large pan of water to the boil, add the fries and cook for 5 minutes. Drain thoroughly then transfer to a wire cooling rack. Spread out in an even layer and leave to cool completely. 3. Put half of the fries into a large food bag with half of the polenta. Seal the bag and shake to coat. Arrange the fries on a baking tray, making sure they’re spaced apart evenly. Repeat with the remaining fries and polenta. 4. Spray the fries with oil, bake for 10 minutes then remove from the oven and use a spatula to turn the fries. Return to the oven for a further 10 minutes or until crisp, then season to taste and serve.